You can detach 1 Xyz Material from this card; this turn, this card can attack all monsters your opponent controls, once each. At the start of the Damage Step, if this card battles an opponent's face-up Special Summoned monster: That monster's ATK and DEF become 0. 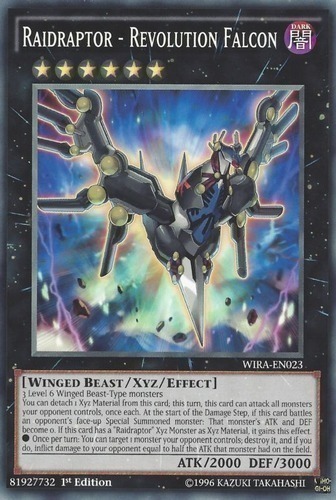 If this card has a "Raidraptor" Xyz Monster as Xyz Material, it gains this effect. ● Once per turn: You can target 1 monster your opponent controls; destroy it, and if you do, inflict damage to your opponent equal to half the ATK that monster had on the field.